In the UK, most of the population lives in urban areas. In fact, in 2014, 74% of people lived in an urban area, the highest in the OECD. In Australia too, it’s high, at 70%. Across the whole OECD, the figure still stands at 46%. Given that cities and towns are home to most of us, it’s clear we need good urban design to generate the best quality of life. This article looks at how one company is working to leverage behavioural insights to design better cities and public spaces which celebrate how people and communities live, work and play. These insights could facilitate mass behaviour change in cities all over the world. Over the past few decades, cities have been designed for cars, not people, leading to poor and even unsafe experiences for city dwellers. Cities and urban areas are still, as the esteemed Danish architect Jan Gehl (pictured) says, the “product of the traffic engineers’ heyday”. Often, the ratio of space for cars versus people is completely out of balance. For example, research by Gehl in New York City’s Times Square, found that 90% of the available space was allocated to cars whilst 90% of the people were pedestrians. City planners know a striking amount about cars in their city and do a great job of monitoring and collecting statistics on traffic flows, parking spaces and driving violations, but Gehl has found, they tend to do a really poor job of gathering behavioural data on pedestrians. They know very little about when, how and where their city dwellers are moving, what they are doing and what they would like to do. Poor design of urban space can also confine people and encourage them to use their cars to get around, rather than walking or using public transport. In an era of multiple health crises linked to a lack of physical activity, it’s even more important to encourage people to use their own two feet and urban design has to incorporate this imperative. Frustrated with the misaligned focus on the car and spurred by his psychologist wife who asked why architects didn’t try to understand people as well as buildings, Gehl formed Gehl Architects to specialise in the design of public spaces in urban areas. Their novel approach makes them literal behavioural architects! It also bears some similarity to the thinking of Jane Jacobs, author of 1961 book “The Death and Life of Great American Cities”, who was a much earlier proponent of humane urban planning. Who is moving around? - Is it only one demographic, or is it varied, including the elderly and young children? They use ethnographic techniques to observe behaviour at all times of day during the week and weekends, counting how many men, women, children of all ages pass by and what routes they take, where they linger, sit down, what places they avoid etc. 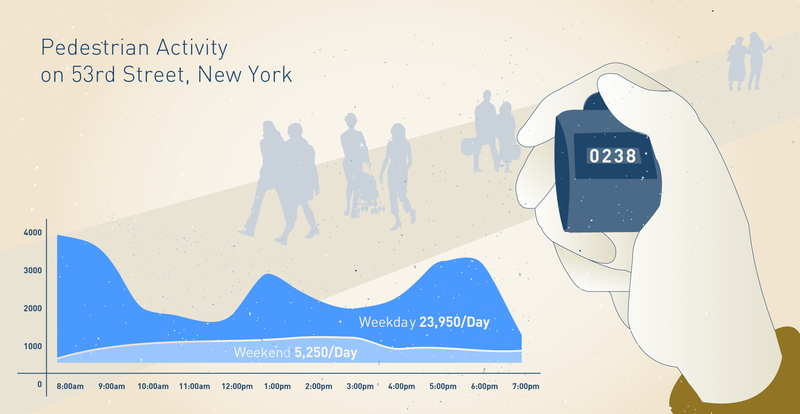 For example, see the chart below plotting pedestrian activity over the course of a day on 53rd Street, New York City. Their observations there revealed that only 10% of pedestrians were children or elderly, even though these groups make up 30% of the city’s population. One thing they’ve come to understand is that low numbers of the young and old is a key indicator of a public space that is failing to meet the needs of its citizens. They take note of where people jaywalk, how long the wait is at traffic lights (in Sydney’s George St they found that wait times could be as much as 52% of the walk time between two places), the areas and streets they avoid, and what obstacles they have to negotiate. They track the literal behavioural journey of urban dwellers. Noting that people automatically tend to take the easiest or most attractive route rather than the designated route, Gehl’s team analyses the factors which contribute to attractiveness and ease of movement: the position of and number of bins, the tactile surfaces of pavements, the availability of seating areas, fear of or threat of crime and insecurity, lighting levels and the need for lighting, and even if wind funnels through certain areas and how and where natural light and sunlight falls through the day. They also analyse “visual pollution” from road signage, since too many signs can be overwhelming. We tend to notice what stands out and is most salient, but if there is too much clutter - too much trying to grab our attention - our eyes won’t be drawn to anything in particular and we’ll experience information overload. They’ve now worked in numerous cities around the world - including Copenhagen – one of the most forward-thinking cities and early movers, Moscow, Los Angeles, Brighton, Sydney, Southampton, Mexico City, New York City, Stockholm, Perth and Sofia. 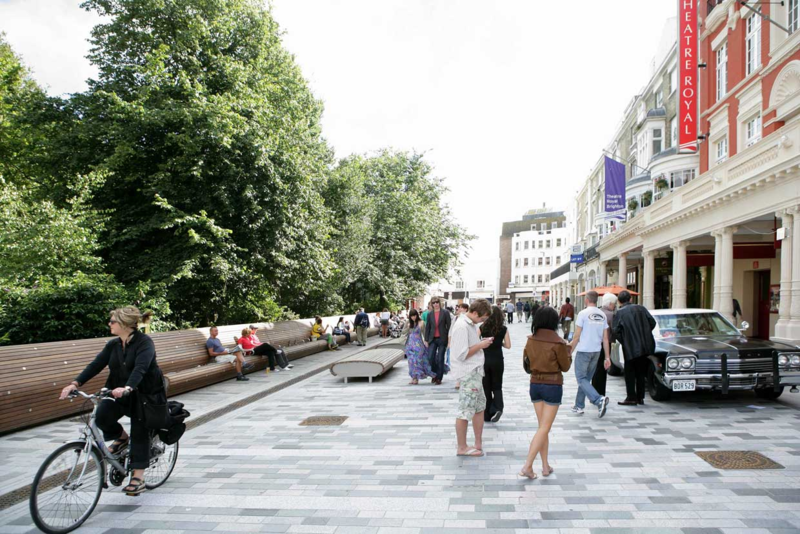 They use the behavioural insights they collect to improve the ‘choice architecture’ in a public space - making it easier for pedestrians to move around, making spaces more enticing to linger in by creating positive affect, making them attractive to the eye or touch, removing threats, or priming an activity or mood. They also interviewed locals, traders associations, councillors and the varied cultural institutions in the area to understand their current use of the shops, restaurants, theatres and gardens; to identify the different types of activity in the street as well as people’s aspirations for the area. Because shop owners on the street were worried about losing business if the street was completely pedestrianised, the team agreed to make it a shared space, but one which prioritised pedestrians over cars. They resurfaced the entire street with natural stone (granite), removing the cues which we automatically associate with the car - the kerbs, crossings and road signs - to leave no delineation between the pavements and roadway. To prime people to linger and make it easier to spend leisure time there, they replaced the car parking spaces with a carefully honed, long wooden bench looking onto the edge of the Pavilion gardens which backed onto the street. 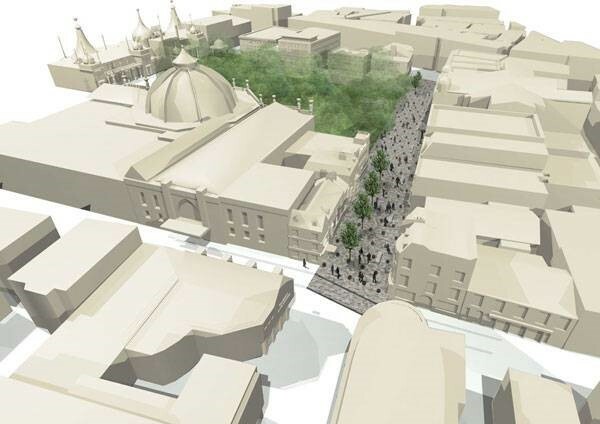 To further prime the context to convey positive feelings of relaxation and encourage lingering and appreciation of surroundings they cut back the trees in the park so that the iconic Brighton Pavilion buildings could be seen from the street. Uniquely, they also consulted the Guide Dogs for the Blind Association, not only to ensure the redesign met the needs of the visually impaired, but also to use the same sensory techniques which facilitate their mobility, to move and channel people through the space, for instance drawing on tactile guidance strips to mark the edge of the street and textured paving areas to mark thresholds (e.g. to shops) and potential hazards. This generates unconscious, sensory feedback to guide pedestrians smoothly through the street. Noting that the street, which houses a number of theatres, had potential for evening socialising, they also redesigned the lighting to be warm and bright so that it felt welcoming and safe, even working with a lighting artist to build tiny lights into the wooden bench to make it feel warmer and encourage people to linger. Then they trained city staff to quantitatively assess and track pedestrian movement, so they could measure the sustained impact of the redesigns and analyse and document how people were using new spaces. A survey carried out in 2008, just one year after the road reopened, showed that traffic levels had dropped by 93%, the number of pedestrians had risen by 162%, and cycling had risen by 22%. Importantly, there had been a huge uplift - 600% - in people lingering, socialising and enjoying the area. Surveys of the street pre-renovation found little to no activity, but in 2008 a survey at 10am, 1pm, 4pm and 8pm, captured 500 ‘staying activities’. By 2010 New Road was the fourth most visited place in the city. People now enjoy spending time there. The shared space for cars and pedestrians also appears to have been a success. Monitoring of cars on New Road showed that they drove at extremely low speeds, and very tentatively. The project went on to win no less than four awards in urban design. The redesigned New Road in Brighton. And a new satellite city planned in SW China near Chengdu, has a layout which has been designed so that any location can be reached on foot in 15 minutes. You could argue that for years much of the emphasis of architecture and urban design in cities has been anti-people - benches that are hard to sit on and which discourage the lingering and even lying down, which Gehl identifies as important, the removal of public toilets, a dearth of pedestrian areas and, above all, a focus on the car. 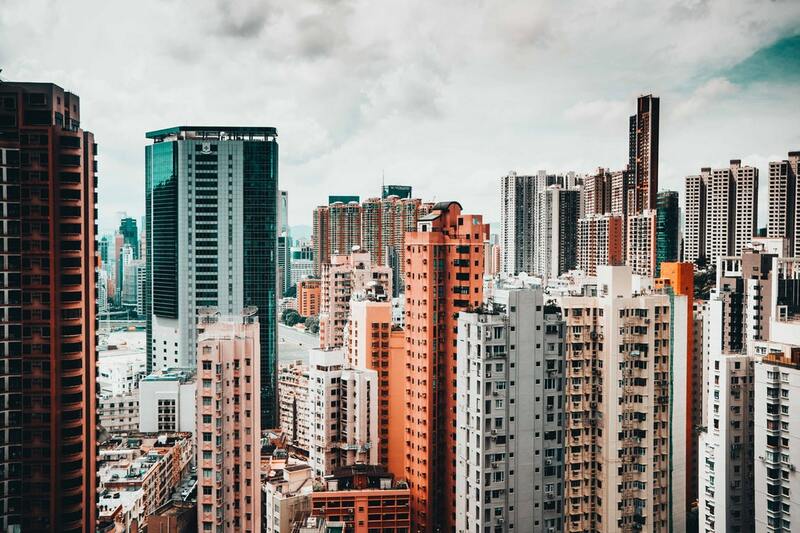 In 2018 cities are changing, both their business and social roles are in flux and there is, therefore, no better time for us to ‘re- architect’ cities which understand human behaviour in order to put people first and build stronger societies as a result.